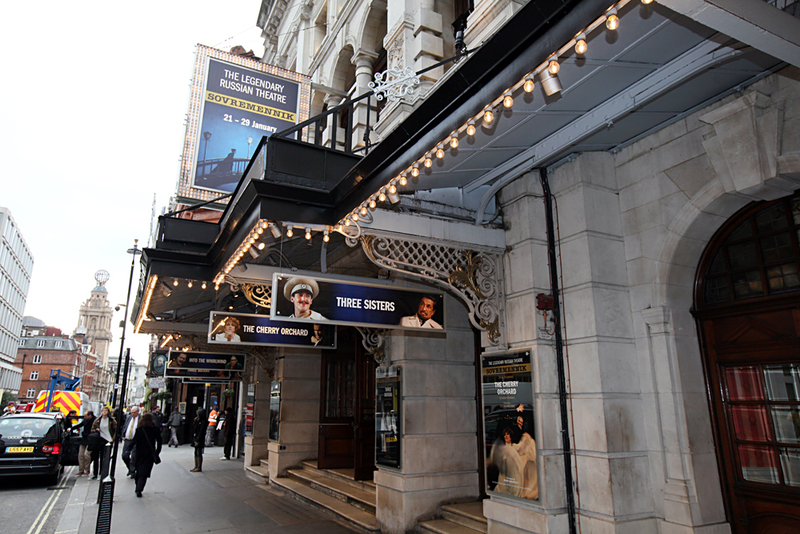 The theater's tour in London, 2011. One of Moscow’s leading theaters, the Sovremennik, is marking its 60th anniversary. The theater, which was founded in the year when Stalin’s personality cult and purges were exposed, continues to appeal to ordinary people and attract new audiences on its tours to Europe and America. April 15 marks the 60th anniversary for one of Moscow’s leading theaters, the Sovremennik, one of the main symbols of the “thaw,” a period of relative democratization under Soviet leader Nikita Khrushchev from the mid-1950s to the mid-1960s). The theater, whose name translates as “The Contemporary,” was the first in the USSR in many years to be set up not on an order from above but on the initiative of a group of young actors, who graduated from the Moscow Art Theater (MKhT) School-Studio. Their manifesto was driven by opposition to their alma mater, the official and ponderous MKhT. It was the time when the personality cult of dictator Joseph Stalin was exposed and denounced (in 1956), censorship was eased, and Aleksandr Solzhenitsyn’s searing novel about life in the Gulag, One Day in the Life of Ivan Denisovich, was published. The newly established Sovremennik did not have a political, nonconformist agenda, like Yury Lyubimov’s famous Taganka Theater, which emerged later. But it created a revolution when its actors began to speak from the stage like ordinary people in the street did, when it began to address its contemporaries, with their anxieties and troubles. The theater’s first production, a play by Viktor Rozov called Forever Alive, opened on Apr. 15, 1956. A year later, the same play would become the script for the acclaimed Soviet film The Cranes Are Flying, which won the Palme d'Or at the 1958 Cannes Film Festival. The audience were so affected by this story of love and war, by how sincere and truthful the acting was, that they did not want to leave and remained at the theater till early in the morning, talking to the actors. It became clear that this was not just a new theater company that had been born but a new theatrical esthetic, a reply of sorts to the European New Wave with its focus on the ordinary individual. For five years, the Sovremennik did not have a building of its own and had to perform at different venues. In 1961, the theater was given the old building of a former restaurant in Mayakovsky Square. Soon, the address became a theater mecca for the Moscow intelligentsia. The Sovremennik became the hottest ticket in town. The lights inside the theater never went out as the actors, driven by the enthusiasm for what they were doing, rehearsed deep into the night. The Sovremennik was run on a democratic model, with all the decisions taken by an artistic council made up of the founding actors. In the 1970s, the theater survived a deep crisis. The “thaw” of the Khrushchev period was over, replaced by years of political reaction and stagnation under Leonid Brezhnev. In a further blow to the theater, Oleg Yefremov was offered the job of artistic director of the Sovremennik’s chief rival, the MKhT. Together with a group of actors, he left. Many predicted that the Sovremennik would not survive, but it did, beginning a new life in a building in the Chistiye Prudy district. The theater was now headed by Galina Volchek, who invited leading young directors – today’s stars Valery Fokin, Yosif Raichelgauz, Roman Viktyuk – and directed many productions herself, touching on sensitive and taboo subjects of the time. Sovremennik was the first Soviet theater to address the issue of drug trafficking (in an adaptation of Chinghiz Aitmatov’s novel The Scaffold) or prostitution (in a production of Alexander Galin’s play Stars in the Morning Sky). Its real breakthrough, however, came with the play Steep Route, based on the memoirs of Gulag prisoner Yevgenia Ginzburg, which left audiences stunned. Over three hours, the heroines of the play lived through years of unbearable suffering, humiliation and torture in Stalinist camps but managed to maintain their dignity. The play brought the Sovremennik huge success in Germany and Finland. During its sensational tour to New York in 1997, the theater received the Drama Desk Award, which had never before been presented to a foreign theater. Since then, the theater has frequently toured abroad: in Israel, the U.S., France, the UK, Poland, and Brazil. It is best known for its iconic productions of Erich Maria Remarque’s Three Comrades and Chekhov’s Three Sisters. While in recent years, Sovremennik has become more solid and respectable, one thing remains constant: It is still much-loved by critics and the public, both at home and abroad.